Rupert M Loydell’s latest chapbook is an elegant requiem for the forgotten sound of meaning between significant others. The songs of absence and dislocation to be found within take the form of a series of prose poems charting the possible decline in the fictionalised protagonist’s relationship and marriage, necessitating both regret and reflection in a series of pastoral settings subject to deterioration and leading to survival and a sense of renunciation. The flood or avalanche of memories (the title of this article stemming from the first line of the poem entitled, Ice Copy) are the core of the book, which knowing something of Loydell’s dedication to contemporary music, produces a folksome, even conceptual air, leavened by references to such luminaries as the progenitor of Ambient Music, (I recommend RML’s separately printed 8 Mesostics For Brian Eno heartily), Hiroshi Yoshimura, Mark Rothko and the band Earlyguard. ‘This is not the place I thought I’d live. Stuttered sentences and forgotten dreams. An empty lexicon. I don’t remember. Part of us will never be. or Clouds’ ‘Vacant sky. There is nothing to make sense of in our monovision world. Showing how we are able to re-imagine and re-interpret the world after heartbreak or pain on any number of levels, even as failure and/or disappointment robs us of perspective. The pieces, therefore form a progression, a narrative of sorts, an implied concept, as I have suggested that demystifies the process of art while at the same time securing its accomplishments. The Nine Postcards sequence uses artful and affecting imagery, such as the aforementioned ‘Cold ghost Avalanche,’ or ‘Madness is a medicine,’ or ‘Let it rain. Let us navigate the heavy seas of love..’ to make its points but does so in an understated and relateable way. Modernist poetry often squeezes the wounded thought to produce a haemorrage or (sometimes) clot of language, but here Loydell draws attention to what most people envisage a poem to be. He then adapts it into the poetically infused prose of the journal or dream diary. His pieces, in transposing these forms, seek connection and redress what we all know and observe around us in, if not new clothes entirely, then certainly in freshly laundered ones. He has allowed us to see some of his private fears and experiences (without implying this is any way autobiographical) while at the same time remaining in control. The sometimes conservative approach to language in other parts of the book conceals a darker fire and leads us to question all things that come before us, just as we are questioning those for whom we have lost devotion. But more importantly, these prose poems shows the writer conversing, arguing and examining the facts of his/her and their detachment. The levels of despair are eased by a dignified and mature consideration of the circumstances that created them and deal sensitively with the speaker’s concerns as a constellation of emotions known to us all, forms his existant universe. Introspection expands into said philosophy and the hearts journalism creates headlines for reader and poet alike. 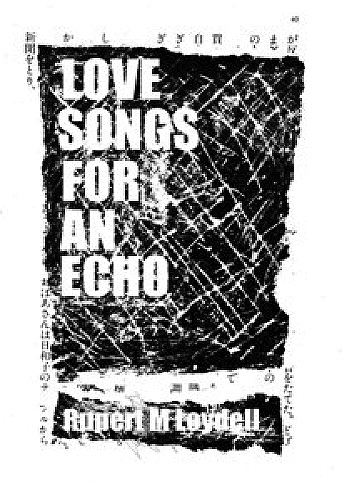 This entry was posted on 21 April, 2016 in homepage and tagged David Erdos, Love Songs for an Echo, Rupert Loydell. Bookmark the permalink.